DWDM Mux/Demux modules are pa of a series of high performance products based on silica-on-silicon planar technology. The AWG chips Fiberinthebox used for DWDM Mux/Demux are targeted for Long-Haul, Metro and access applications, where outstanding optical performance and low cost are paramount. Athermal Arrayed Waveguide Grating (AAWG) DWDM Modules features of athermal packaging design require no electrical power, software or temperature control. Thermal Arrayed Waveguide Grating (TAWG) DWDM Modules are designed for use within the C-band release of DWDM system. To decrease the power dissipation of the devices in different environmental conditions, the AWG package is special designed with selection of reliable thermal plastic with low thermal conduction, and the AWG operating temperature is controlled by using foil resist heater or Peltier TEC with thermistor temperature sensor. 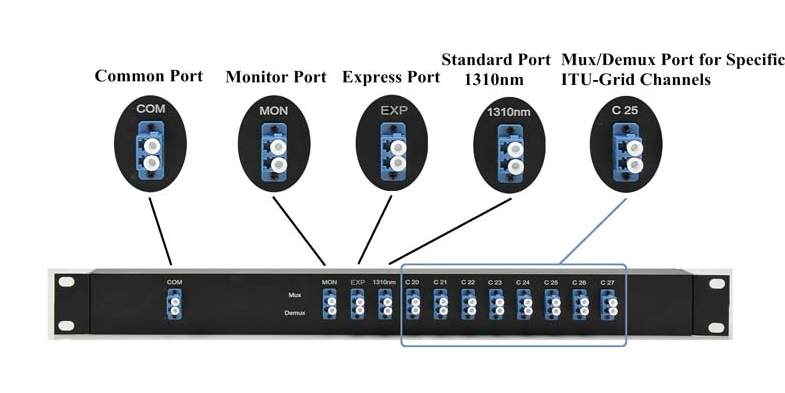 The channel spacing for DWDM is 1.6/0.8/0.4 nm (200GHz/100 GHz/50 GHz grid). This small channel spacing allows to transmit simultaneously much more information. Note: Actual layout depends on the chosen connector type as well as other factors. However, the principal scheme stays the same. *Note: Insertion Loss values do not include connector losses.